I Won Bingo is no longer endorsed by bingogals. Please check our USA Bingo Reviews for our favorite USA bingo sites. I Won Bingo was formed by a group of avid online bingo players. I Won Bingo provide an entertainment, enjoyable and stimulating virtual playing environment whereby players compete with others from over the world in a friendly game of Bingo from the confort of their home. As of December 2011 I Won Bingo has been changed to Amigo Bingo. For more information please read our Amigo Bingo Review. IWonBingo offers a $20 no deposit bingo bonus for free trial and they do have an amazing 300% first deposit bonus. IWonBingo.com offers a regular deposit bonus of up to 400% + 100% bbs. I Won Bingo have great jackpots and just by looking at the winners page you can see there are multiple winners every day in bingo and slots. IWonBingo offers bingo games in 75 balls only. I Won Bingo offers email support only. IWonBingo has many Deposit Options including: Use My Wallet . Toggle Card . E Check . Insta Debit . Use My Bank . Eco Card . Ipoint . E Wallet Xpress and 900 Pay. As for Payout Options they offer: E Wallet Xpress . Insta Debit . Neteller. 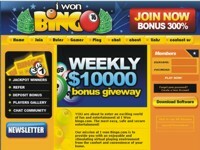 IWonBingo.com has nice site graphics but, not one of the best that we have seen. I Won Bingo is run on Parlay Software. They are one of the pioneers of online software and have all the features, including security that you will need to play online bingo. The Overall Rating for I Won Bingo is 8.6 which considered above average. We would like to see them offer a better loyalty program and more game variety, but the bonuses and jackpots are excellent. If you are looking for a place to play online games bingo with big bingo prizes than I Won Bingo is the place for you. Every Saturday there is $10,000 giveaway.